I just wanted to keep you up to date on the 2 puppies that I bought from you almost 8 years ago! Moses is my big chocolate boy (Rosie x Abraham) who loved to train in obedience. We earned a CD a couple years back and loved to dabble in agility- weave poles were his favorite- before I had to retire him . He loves his walks in the field just about every day and lives to greet me at the door with a toy in his mouth and parade around the house with my pajama bottoms! Maggie May (Maddy x Cash) is my little yellow girl who has exceeded very well in the sport of agility. 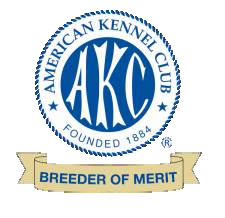 In fact it is why I am writing you today- as she earned her AKC title "PAX" (preferred agility champion) on October 15! She is such a tiny little thing (measures 19" at shoulder) that I dropped her to the 'Preferred' classes which is16" as opposed to her required jump height of 20". She actually earned her 20 double qualifying runs in her 20" jump class but could never reach the 750 points required to receive a MACH (master agility champion). I dropped her to 16" jump height after receiving 22 double Qs and earning 412 points. So after earning her 20th double qulaifying runs in the preferred classes she has finally reached the pinnacle of her agility career! We are very excited and plan to continue to run in the 16" preferred division as long as her health remains excellent! She loves to run agility- although I think it's the treats that she receives after running each run that motivates her the most! Both dogs have given me such joy and pride and I am grateful to have them in my life! I just thought that after 8 years you should know how well 2 of your puppies have done in the performance rings!! I have atteached a some pics. Just to thank you and let you know that Coopie is the most incredible dog - extremely handsome, like his dad, and ready to work. He has done very well in obedience and is starting rally (for fun, not competition) - he is calm and well mannered and gets along with young and old, big and small dogs, and people and kids. He goes to the dog park and playgroup every day and will swim and play endlessly. He, of course, loves to eat . . .
Just a quick not to tell you how much joy Dory has brought to the house and to our other lab, Hattie. There was a week and half adjustment period on Hattie's part but after that they are best of buds. Dory will go right up to Hattie and take the chewy right out of her mouth then they chase one another around the house. They are so mush fun, and fun to watch them interact. I am so glad we found your kennel. It's one of the nicest facility we have ever seen and very well run. I will no problem recommending Integrity Farms to anyone looking for a GOOD lab breeder. I know Dr. Rabaut has mentioned your name to several clients already and so have I. Thanks again Brenda for everything we have just fallen in love with that little yellow girl and so has Hattie. Hello Brenda, my wife Marilyn arranged to acquire a female black lab puppy from you in 2011. Her parents were Gucci and Mason, and we named her Emma. She is our fourth lab, and is truly a magnificent dog. She is as close to perfect as a dog can be. She is beautiful to look at, full of love and always keen to play. She gets at least two long walks every day and an hour or so of fetch and or Frisbee, and is always ready for more. She did agility training which she took to right off, and loved it. She also completed therapy dog testing. There are several other dogs in the neighborhood that she plays with in the yard, but it is time for a puppy sister, as she loves other dogs, especially labs, almost as much as she loves people. As one of the neighbors said, "Emma loves everyone and everyone loves Emma". Integrity Farms can rightfully be proud of the job you do, because if Emma is representative, your dogs are simply wonderful. Marilyn sent you an application for a puppy last week and we wanted to send you a few thoughts on Emma, and the attached photos. Words cannot express how happy we are with our new puppy. His name is Lambeau (after the Green Bay Packers home field). He is a gem. He has slept through the night since we brought him home with no mess in his crate when we wake up at 6 am. He’s always happy, tail wagging and eager to be pet. We love him as if he were always with our family. Our boys are thrilled to have a new baby brother and have played with him every moment they can including in pajamas at 6 am outside! I just thought you should know that all your hard work and dedication makes a difference to families like ours – we are looking forward to many, many years together. Mars has been in our family here in Freehold, NJ for approximately two and a half years now and the 308 mile one way trek to your farm in Derry, NH was the most worthwhile and rewarding journey that our family has ever made. Mars is regularly complemented for his temperament, excellent coat and general handsome features. This is especially pleasing on the numerous occasions that various vets have been so enthusiastic when they give Mars his routine exams, immunizations, etc. I am frequently encouraged by these vets, (and also others, including his former obedience trainers), to get Mars certified as an official therapy dog due to his temperament. All of these features are thanks to your excellent breeding skills and I have recommended you warmly to all that have enquired with regard to his origin. There are those that think that I am crazy to have travelled so far to obtain a responsibly well bred healthy Chocolate Labrador Puppy, but the justification of what a delightful and healthy dog that brings us so much joy is evident for all to see! There are so many irresponsible breeders out there! Even if I had not bought a puppy from you, your website is an excellent education resource for all responsbile potential owners. When we purchase our next puppy we will make the trek back to you all over again. The only difference will be to split the 612 miles over two days instead of within one! That first journey served him well in retrospect as he travels with us without any complaints at all. Over July 4th weekend this year we drove up and around to the Adirondacks and Vermont, based in Burlington, VT with one of the nights spent in the local VCA vet boarding facility while we went up to Montreal, and all the others in a local four star hotel. Mars was his usual well tempered self throughout. As you can see from the photos, Mars is a true Labrador in that he simply adores swimming and retrieving things in our pool! If you ever need any form of testimonial or reference I would be delighted to be of assistance. My wife and I would like to thank you from the bottom of our hearts for the wonderful female chocolate (later named Kelsey….from your Bella X Bentley litter). Prior to getting Kelsey my wife and I had to put down our first dog Shea (got from a breeder in CT...at age 1 we were told she had chronic renal failure which sadly ended her wonderful life with us prior to turning 4). As dog people we knew we wanted to get another “brown clown” as we call them but wanted to be sure we didn’t get our hearts broken again. We instantly feel in love with her the second we had her in our arms. We have had no problems with her whatsoever. She instantly grew a love for the water, romps in the field, rides in the truck and making new dog buddies in our neighborhood. She has such a wonderful demeanor. We even started to take her to Puppy classes where she will do just about anything for a small piece of cheese. We are truly blessed to have gotten such a wonderful dog from you and look forward to growing together as a family any making lots of memories. I would absolutely recommend anyone who is thinking of getting a lab to go thru you. You have forever changed our lives. Best of luck with future litters. P.S. Next year we plan on moving into a bigger house and getting another “brown clown” so I will keep you on speed dial. This update on Maddy is long overdue. She is just the greatest little puppy and we are so happy that she is a part of our family! Everyone comments on how cute she is and what a great Lab look she has. She definitely has a spunky, mischievous side, too. We are taking puppy classes and she goes to daycare some days where she plays with friends. After learning that she was a singleton, the trainers remark what a great job the breeder (you) did in socializing her. We just wanted to thank you for our precious little girl! I attached a recent picture of her. Hope you are doing well. I don't know if you remember me because i was like 6 at the time, now 13. My parents are Karen and Tom . We got one of Lady Jane and Bounders pups.He is not a pup anymore, he's now almost 8. I just wanted to say Thank You so much. He is such a wonderful dog, and i don't think anyone could ask for a better dog then him. Even people that hate dogs, love Him. He's a big teddy bear and such a joy to be around. He's a big, lazy boy who just wants a ton of love and gives you 100% love back 27/ 7. My dad's friend loves Him to death. Everytime he comes over our house our boy paces at the window waiting for him to come in and roll all over the floor with him. He's also so good with my 5 yr old sister. She'll lay on him and he'll just kiss her for hours. He's also very protective of her. Its so cute. The other day my sister went to go to her friends house across the street and my mom let him out to go to the bathroom and he'll just watch her until she get's in the house then he'll go do his stuff. It's like he's parenting her. Today, March 19, 07 we brought him up to Hampton beach (Even though for some reason he HATES water? Don't know why, we never forced him.) before he's not allowed to be on it and it was so hilarious watching him run back and forth with his tongue hanging out to the side. A recent thing we've been noticing with him,is if were not petting him in the morning or if were walking him and come across another dog and start petting the other dog, he'll sit there and point his big, brown eyes at you and start to whine. Its so adorable. In the morning he's so cute! He'll have his stuffed, fake, yellow ducky in his mouth and he'll grunt like a pig and he'll snort and bounce around until we greet him with a long pat. The one thing me and my mom were talking about the other night thats bad about having a lab is, if they do something wrong its hard to stay mad at them for over a minute because there so stinkin' cute! Our neighbors The Kimballs, Also bought a dog off of you. Major,and him are the best of buds. They love running back and forth in the yard together. The other day we brought him to a kids park near us and walked him down to the river behind it. This super nice lady and her two kids came running up to us freaking out, about how beautiful they thought he was. She mentioned she had been looking for a good English Style Lab Breeder and we gave her your website. So you'll probabally be getting a call from her or already did. Well I think its time for me to go. I just want to thank you for this wonderful dog, friend, and life time cutie. You have a gift for breeding beautiful Labs and no Lab beats the Labs that come from you. Thank you so much, good luck with your breeding program,and keep up the excellent work!